Situated on the bottom floor of the Customs House, this restaurant is often busy and surrounded by suits during the day for business lunches and casual diners at night. I came here one sunny and glorious day in Sydney and was hoping to be seated on the verandah, alas, that was not the case. We always come here for the pizzas, however, the choices are very limited 8 to be exact but they do serve other dishes besides pizza – ranging from salad, pasta, fish, beef and pizza. Whenever I come here with my brother, we always get one pizza and one salad. I absolutely love their cured ocean trout with baby spinach, avocado and capers. My brother always gets the Bocca pizza which is king prawns, clams, mussels and octopus. We have tried others but he absolutely loves the Bocca! A generous serving of cured ocean trout with baby spinach, avocado and capers was placed in front of me, and this was unbelievably light and tasty. 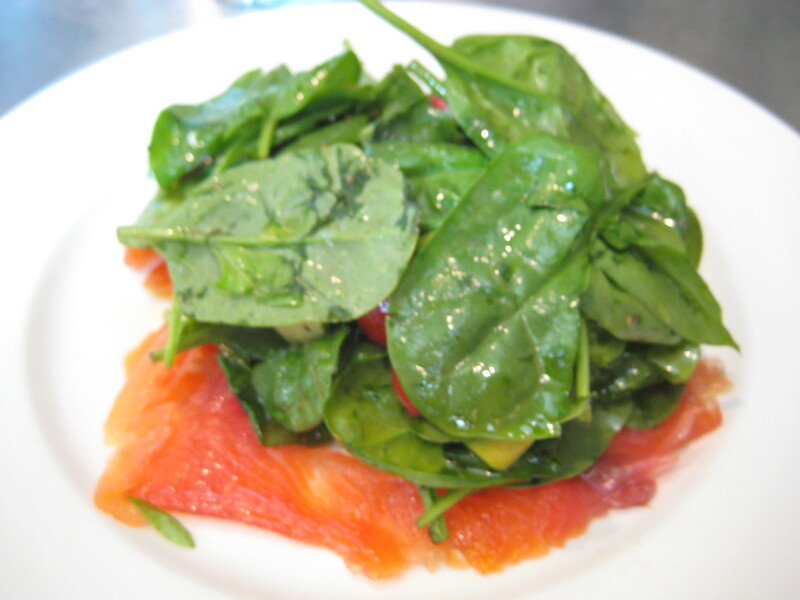 The cured ocean trout was not as salty as a normal smoked salmon and the baby spinach and avocado were fresh. The only complaint I would make – if it’s a ‘complaint’ was it had too much olive oil – the baby spinach was ‘glowing’ in olive oil. 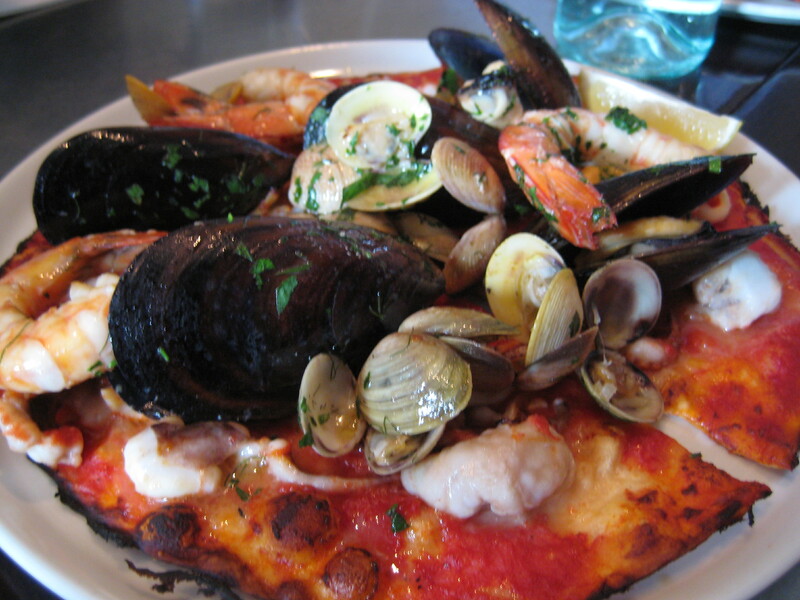 The Bocca pizza had generous amounts of clams, mussels and prawns. Served on a thin and crispy crust, this was absolutely delicious. All the seafood were fresh and was cooked to perfection. Cut into large quarters, I can see my brother not wanting to share any of this with me! However, I did manage to steal a piece in exchange of some of my salad. J and N ordered the Miles pizza which was san Danielle prosciutto, tomato and rocket and battered zucchini flowers with ricotta and harissa. 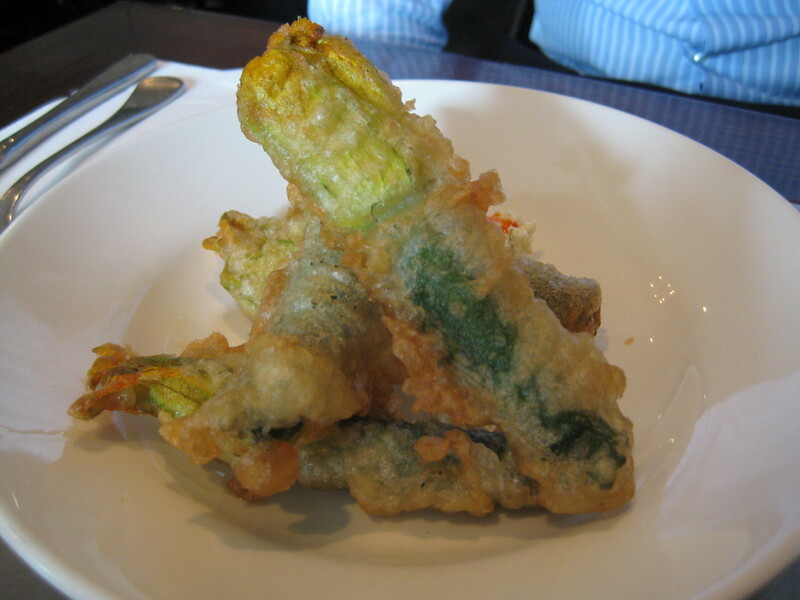 The battered zucchini flowers with ricotta and harrissa was nicely presented. N thought the zucchini flowers were a little oily for her liking and only had one. Fortunately for J, he got to eat the rest of it. 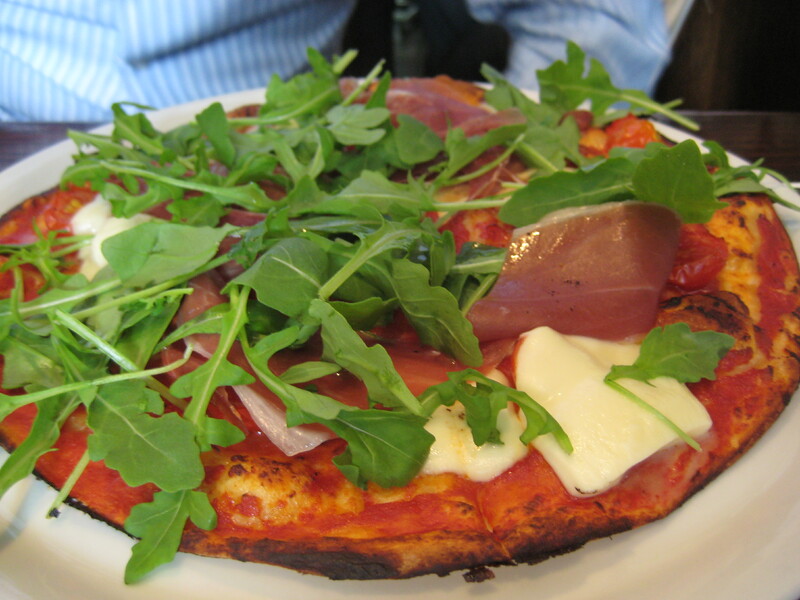 The Miles pizza was good – same crust, generous serving of prosciutto. The rocket on the pizza gave it a nice bitter flavour. The toppings on the pizzas are quite generous. A great place for lunch or dinner or even after work drinks. Love this place btw, should go here more often. Brekkie @ Bills Sydney Cafe XXII … dinner this time!